Sweetheart is a female fawn pug. She was born 5/5/2006. 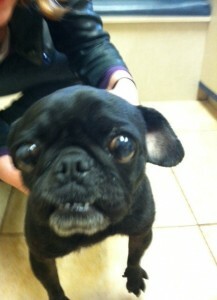 She is being treated for some skin issues, will be spayed, have a dental, and shots and will be placed into foster care. 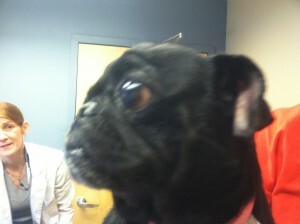 “Sweetheart is a female black pug. She was born 5/5/2006. She is being treated for some skin issues, will be spayed, have a dental, and shots and will be placed into foster care. I have two rescued 4 yr. old male pugs–how long before you know how she gets along with other dogs? We just lost our little black female a couple of months ago and are still mourning her loss.